If you’re interested in adding a wall or raised planter to your garden, there are many techniques and materials from which to choose. 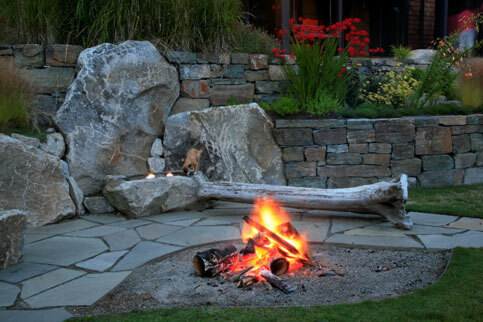 Depending on the style or your garden and aesthetic preferences, options include; block, poured concrete, brick, mortared stone, gabion… A technique that is quickly becoming a personal favorite of mine, is dry-stack stone. Dry-stack construction has existed for centuries. Terraced retaining walls built by the Incas at Machu Picchu are some of the most well-known examples of this technique. Not only have these walls endured decades of harsh weather, but they’ve survived earthquakes and centuries of use as well. It’s not only their durability that makes dry-stacked stone walls a smart choice for a landscape, but also their versatility, character and beauty. The basics: A dry-stacked wall is any stone wall constructed without the use of mortar to bind it together. These walls gain strength from the weight of interlocking stones stacked with a slight batter, or upward and backward slope. Because these walls are constructed without mortar, they have the ability to bend and flex with the movement of the earth during warming periods and frost. For this reason a dry-stacked wall does not require a conventional foundation set deep below the frostline. 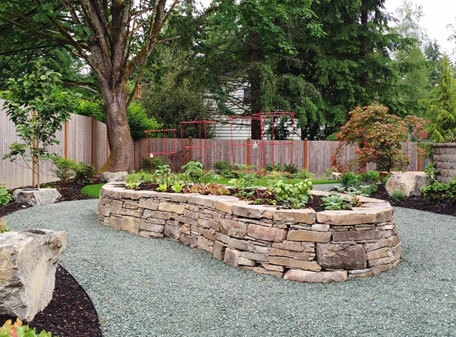 Stones with two basic shapes can be used for dry-stacked walls: rounded fieldstone and river rock, or the more commonly used angular, flat stone. Beyond aesthetics, accessibility to materials is a major factor in determining which type of stone to choose. In an ideal situation, the stone could be found onsite. If this is not possible, it’s always best to use locally accessible stone to cut-down on the costs to transport it and the carbon footprint necessary to do so. Local stone will also allow your wall to tie in more naturally with the area in which you live. Another factor in determining which type of stone to use is the difficulty level of building the wall. Flat, angular stone is typically much easier and faster to install than stone with rounded edges. 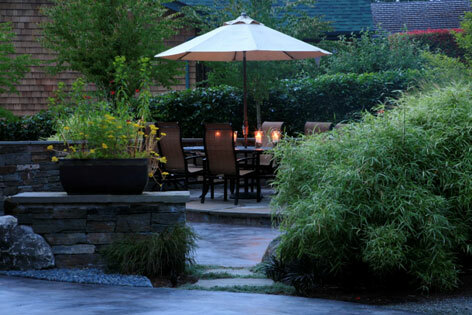 However, a rounded-stone wall can be built to beautiful effect. 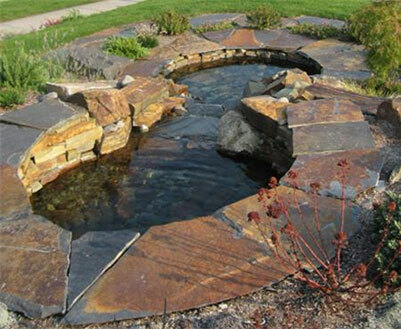 Types of stone include, but are not limited to: slate, sandstone, basalt, quartzite and granite. It’s worth a trip to your local stone yard to see the variety of stone types and colors available, ranging from charcoal gray to mottled rust and honey gold. 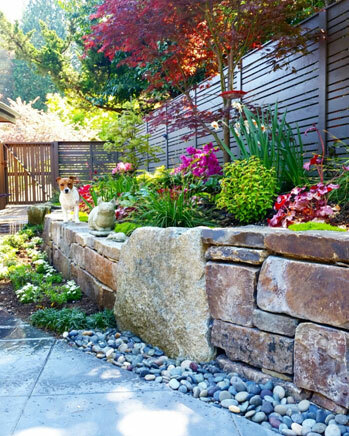 o	Versatility: Dry-stacked walls can be used in a number of ways in the landscape from retaining walls, free-standing walls to raised planters. I’m also a firm believer that drystack walls can be used in almost any style of garden, from traditional to contemporary. o	Natural permeability: Water can pass freely through the wall’s mortarless joints. This alleviates the need for an additional drainage system to be installed behind the wall to divert water and relieve pressure. o	Longevity: The freely stacked stone also allows for some slight expansion and contraction, making it less susceptible to shifting and cracking during freeze-thaw cycles. o	Character and beauty: Because the wall is made of natural stone, there is inherent variability in the color, texture and size of the stone. Craftsmanship also plays a strong role in the overall beauty and character of the wall. It’s clear when a wall has been thoughtfully and lovingly constructed. It takes time! We are lucky to have many highly skilled craftsman as members of the WA Chapter of APLD. o	Appearance: For those who desire a smooth wall surface, the rustic appearance of an unmortared stone wall may not be appealing. Those who would rather have a perfectly vertical wall face may not like the batter most dry-stacked walls have. o	Speed of installation: It takes more time to install a dry-stacked wall than a mortared wall, because the stone needs to be carefully selected and stacked. o	Height: Built-in structural support is a better choice for walls higher than 3 or 4 feet. Low accent wall or seat wall. 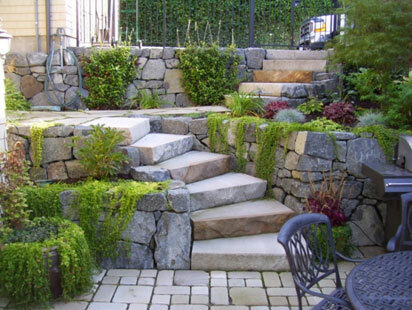 A low accent wall or retaining wall can be used for seating if caped with a wide, flat stone. Framing an outdoor staircase. 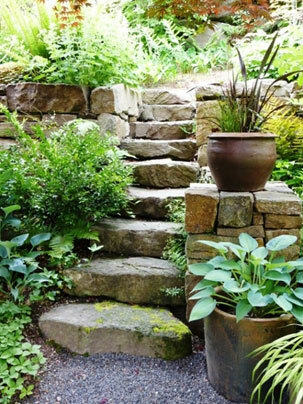 Here a retaining wall frames and blends with a rustic woodland staircase while doubling as a pedestal for a planted container. Planters. 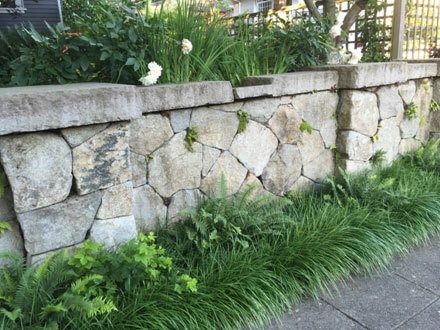 A dry-stacked wall works well for a raised planter. The wide top can double as seating. Retaining walls. 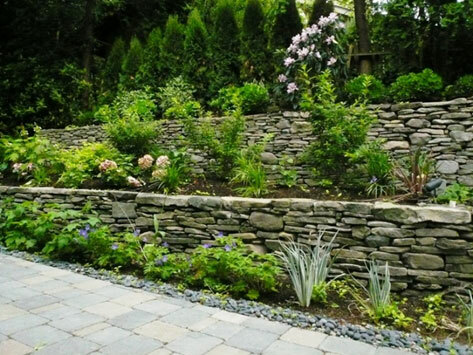 Use a dry-stacked wall as a low retaining wall. Water feature. Here, the dry-stack technique was used to edge a koi pond. With the variety of stone shapes, colors and sizes available, a dry-stacked wall can blend with a variety of architectural styles as well as with the colors and textures in the surrounding landscape. Whatever your style, from rustic to contemporary, a dry-stacked wall can be a functional and attractive option.